Thousands of Sudanese demonstrators marched in Khartoum Saturday, many reaching the army headquarters for the first time since deadly protests against President Omar al-Bashir erupted last year, witnesses said. Chanting "One Army, One People," the protesters rallied in the capital's streets, following a call by organisers to march on the army headquarters. 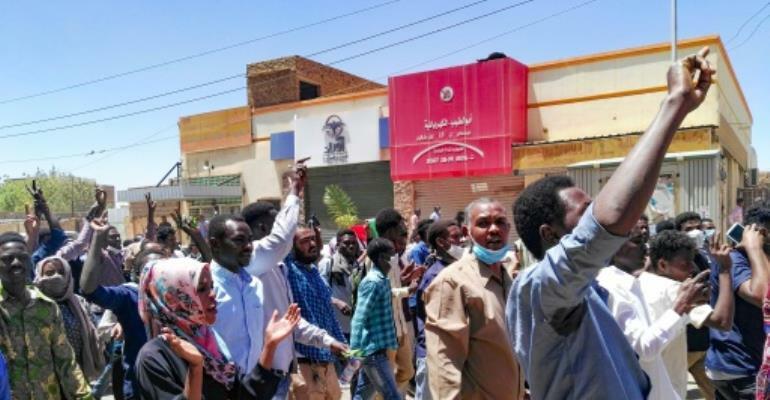 Since the emergency rule came into effect, protests have been largely confined to the capital and its twin city of Omdurman, but organisers had called for widespread rallies and a march on the army headquarters on Saturday. Before the demonstrations began, security forces deployed in large numbers in key Khartoum squares and in Omdurman, across the Nile. "There's a heavy security deployment where the protesters were to gather for the march, but they still came out and are chanting anti-government slogans," a witness told AFP without revealing his name for security reasons. Shops and markets in downtown Khartoum were ordered shut before the march by security agents, according to onlookers. "Those walking in groups were immediately detained or asked to return to their homes by security forces," another onlooker said. In recent days, activists have been circulating leaflets urging residents to participate in Saturday's march, several residents said. Analysts say the movement has emerged as the biggest challenge yet to Bashir's three-decade rule.